This view of the inner harbor of the Corpus Christi Ship Channel shows a laydown yard and wind turbine blades loading to rail, with liquid bulk storage tanks to the left. Texans have a unique energy about them, one that could light up a 55,000-seat stadium on a crisp Friday night. They are also proud of their traditions — football, barbecue and cowboy boots. In South Texas, the Port of Corpus Christi relies on energy to maintain its tradition as an economic driver in the region. Port Corpus Christi serves as the community's industrial hub, this year marking the 90th anniversary of its incorporation. 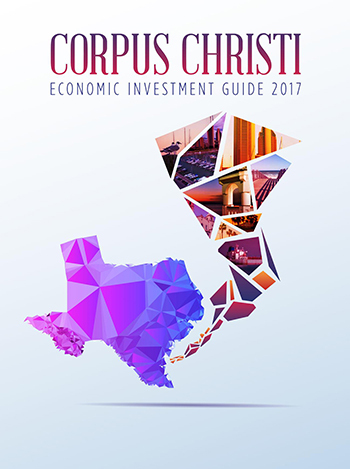 Petrochemical manufacturing plays a large role in the Corpus Christi region's economy, with much of the industrial base centered on the port, which employs over 200. Port Corpus Christi contributes upwards of $319 million in state and local tax revenue. An estimated 76,300 port-related jobs add strength to the Coastal Bend's economy. "There's a lot of industry here which depends on the port and the ship channel for its existence. Without the port, a lot of those industries would not be able to be here," says John LaRue, executive director of Port Corpus Christi. LaRue feels that the port's concentration on energy makes it unique. The port reigns as the fifth-largest US port in tonnage, and while its largest imports are crude oil and dry bulk materials used in the oil fields for the fracking process, much of that tonnage comes from the renewable energy sector. While natural gas may be a Texas mainstay, Port Corpus Christi is diversifying its portfolio to include the wind energy industry. "We're very focused on alternative energy with wind turbines. Port Corpus Christi is probably one of the top three ports in the US in handling components for wind turbines," says LaRue. LaRue, who has a 22-year history with the port, adds, "You have to do what you do well, and we do energy well." The port exports over 100 million tons of cargo annually. A $10-billion LNG plant from Cheniere Energy is under construction and is expected to be fully operational in two and a half years, furthering the region's stronghold in the energy sector. The port also is a steward of the region's natural resources. "Recreational water sports and fishing, whether for sport or commercial, are big industries here," says LaRue. "We're very concerned about protecting the water quality." The port is a founder and one of the largest funders of the Coastal Bend Bays & Estuaries Program, whose mission is to protect, research and restore the bays and estuaries in the Coastal Bend region. "We contribute over $100,000 a year to the program to make sure the estuary stays a viable component of the bays and river system," says LaRue. Furthering its commitment to the Coastal Bend's environment, the port is the first Texas port to join the Green Marine program, a North American environmental certification program for the maritime transportation industry. "The port has had an ISO 14001 certified Environmental Management System (EMS) in place for over 10 years," says LaRue. "Where our EMS program is focused internally on our operations, the Green Marine broadens the scope to the entire port." The program, established in 2007, stems from the maritime industry's voluntary strategy to surpass regulatory requirements. LaRue is proud of the port's commitment to preserving and protecting the Coastal Bend's environment, while being a significant contributor to the region's economy. The impact of Port Corpus Christi's future flows throughout the Coastal Bend region — an estimated $1 billion in projected investments in infrastructure projects will take place there over the next 10 years. Local investments include the port's $70-million contribution to the new Harbor Bridge project, new oil docks 14 and 15 for large crude oil tankers, a new rail yard with eight tracks for unit trains and, most notably, the Channel Improvement Project (widening and deepening of the ship channel) with an estimated cost of about $350 million. The widening will allow the Port of Corpus Christi to mirror the Panama Canal's capabilities. A tanker leaving Corpus Christi is a familiar sight.